Holdsworth fronted the Sports Shield consortium's takeover of the club, then playing in the Championship, last March along with Anderson. They took control of former owner Eddie Davies' 94.5 per cent controlling share of Burnden Leisure, but following several disputes during a year which has seen the club placed under a transfer embargo, Anderson has now bought out Holdsworth's shares. 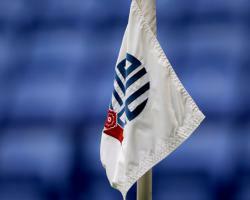 A statement on the club's official website read: "Bolton Wanderers Football Club is pleased to confirm that an agreement has been reached between Ken Anderson and Dean Holdsworth that will see ownership of Sports Shield BWFC Limited transferred to Inner Circle Investments Ltd.
"Both parties acknowledge that certain public statements each has made about the integrity and conduct of the other may have been inappropriate and, on reflection, regrettable. Part of the arrangement has seen both parties agree that Dean will continue his involvement with the club as club ambassador." Bolton are currently third in League One under manager Phil Parkinson's stewardship, one point off second-placed Fleetwood with a game in hand.